← Seanna Bhraig what a grand mountain. 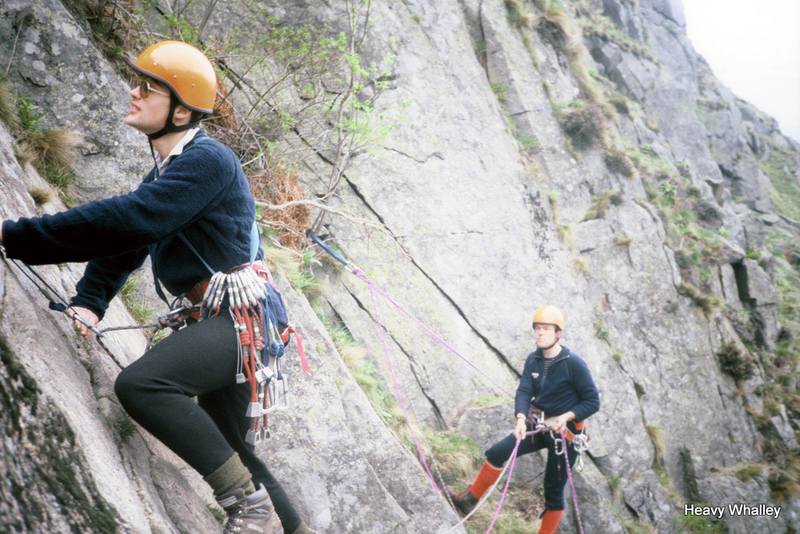 The bothies Magoos and the MBA, Winter climbing and the Late Phil Jones. I was very lucky to been able to re publish this article by my mate Willie MacRitchie an Islander from Lewis. Willie was a very young lad when I met him at RAF Leuchars in Fife in 1985 when he came to join the Mountain Rescue Team. He was a natural it must have been all that cutting the peat as a young boy and looking after the sheep. We have been lucky enough to climb all over the World over the 35 years that I have known him. He is now the Warrant Officer Mountain Rescue Service stationed in RAF Valley in North Wales. The RAF Mountain Rescue Teams could not be in better hands. Over the years when the going get tough Willie is the man to be with, He is still “Mr unassuming” still a boy from the Isles who looks after his people so well. Thank you Willie for letting me show this piece to a wilder audience and thanks for all you do for the Teams. He is a hard man to photo but over the years but I have added a few, sorry mate. Willies tale “So, there I was beavering away in my wee office trying desperately to project the image of someone who might actually know what they were doing when a cheeky face pops around the corner and states that ‘they’ had all agreed that because I was of a certain age and MRS experience I would write a Now and Then article for the On The Hill 75thAnniversary edition. Well, having got over the shock of realising I was now officially seen as an ‘old git’ and the fact that the PS ( FULL TIME STAFF)still attracts a wonderful bunch of rouges and mavericks I smiled to myself and said why not! A little background: I followed the path that many others walked looking for that wee something different that mainstream RAF life could not provide. I got posted to RAF Leuchars in Jan 84 and never had gave the MRT a moment’s thought until a certain Graham ‘Stampy’ Stamp turned up a few months later. Stampy, a gifted mountaineer and all round good guy as a fellow GEF ‘newbie’ got chatting about what I did on a weekend, lager and crisps was the answer. Stampy then regals me with tales of adventure, camaraderie (didn’t even know what that even meant then), socialising beyond my dreams, and most importantly it would put me on the good side of our Chf Tech!! Why should that matter you say… the previous week I had a bollocking to end all bollocking from my Chief a certain mad Irishman by the name of Alister Haveron. Even now, many years later I still vividly remember my knees shaking uncontrollably as a verbal wall of what is now affectionally called ‘mentoring’ was delivered with a fair bit of venom with every third word being ‘feck’ or something sounding very similar! Of course, Alister was already a MR legend then and would go on to even greater exploits with the MRS. So off we go to the MRT Section to see the TL Don Shanks and chat about the possibility of doing a trial. I haven’t even got to the door when this ruddy great Alsatian comes running out all teeth and barking only to be swiftly followed by a small fellow who is even louder than the dog! So that was the day I happened on Dave ‘Heavy’ Whalley and Teallach; little did I know how much this big wee man would influence my MR career. My adventures with Heavy are a story to be told on another day. I went out on my first weekend with Leuchars MRT in May 84 and as I sit here in May 18 I am still a member of the RAF MRS and have seen a fair bit of now and then! Where to start: Might as well begin with ‘trialists’. That first weekend the team deployed to Fort William, staying at Achintee. I turned up at the MR Section full of apprehension and not really having a clue about I was letting myself in for to be met with a total indifference from the ‘troops’ I was a quiet lad anyway but watching the banter and warm fellowship whist getting the cold shoulder was pretty intimidating. As the deployment brief finished Don revealed his master plan, Joe Wiggins was from Islay and as I was from Lewis Joe was tasked with looking after me! We climbed into the back of the LWB Ambulance and off we went, I don’t think we had even passed Hendies pub in Leuchars village before Joe pulled out a hip flask and took a good slug before passing it over and ‘advising’ I have a swig to help me along. Myself and Joe have shared a fair few memorable ‘swigs’ and adventures since that fateful day! In those days there was over 100,000 people in the RAF, the MRS was probably at its highpoint, 6 MRTs fully manned with waiting lists, gods walking the earth in the guise of RAF MR troops, still at the forefront of MR across the UK. Trialists were nothing, ten-a-penny, unproven fodder needing to reach the standards expected without any real guidance, not to be spoken to, no sympathy to be given. Passing your trial was a massive event and you gained immediate respect from the ‘troops’; they had all travelled the same path and knew the pain you had endured Present day is so different, less than 30,000 people in the RAF, 3 MRTs who face severe manning issues daily, trialists few and far between. Potential trialists are proactively engaged with from the moment any interest is shown, ‘troops’ embrace them and impart knowledge and enthusiasm from the start, trialists are now a very valuable commodity. The standards expected from a trialist has not been lowered but there is a level of pragmatism applied that some would find different. If a trialists passes then they pass and crack on but if a trialist is a bit short on fitness, determination could be better, needs to be a better team player etc. in the ‘old’ days they would have failed but we do not have the luxury of waiting lists and we must decide if we are willing to invest in recovering/improve any weakness, a catch 22 question as we are constantly in stretch meeting training targets. What we will not forfeit is the fact that we are a team and anyone who is not a team player fails. Bothies: That first weekend we went to Achintee and stayed in the ATC / Scouts huts. These were old wooden huts not in the best of conditions but deemed more than suitable for RAF MR troops! No showers, probably 1 or 2 toilets between 20-25 troops with military issue toilet paper that spread more than wiped, heating probably not, sleeping on bare wooden / concrete floors, the old Mk5 cooker and ‘bomb’ to cook on. My last weekend out we stayed at the Boulder Adventure Centre in Llanberis, a fantastic venue, carpets and central heating, bunkbeds with linen and duvets provided, showers for all, modern clean toilets with soft toilet paper and a fitted kitchen to die for. The modern MR troop now benefits from all the work put in by their predecessors to ensure they deservedly get equal treatment when deployed. Many a time I would look on disbelievingly as organisations like JARTS would turn up and book themselves into a swanky hotel while the MRT was in a pokey village hall or staying in tents! Vehicles: SWB and LWB Landrovers, RL or was it RJ / MK 4 Tonners, that was state of the art transport when I first joined. As I think back I cringe slightly as I remember getting Police escorts (3 litre Rovers) for the convoy and then hammering along at nearly 42 mph (downhill) in the trucks with a pathetic single blue light whirling away on the roof and a siren that sort off did a ‘nee-naw’ but mostly just a ‘nee’, I can’t help but smile reminiscing about those middle of the night trips! Today we have uber modern Isuzu 4×4 pickups and Mercedes Sprinters as load carriers and the C3 (Control). The blue light suite on these things is unbelievable and sirens that regress you to become a child all over again. The communications package in the C3 is fantastic, VHF/UHF/HF, mobile and satellite phones, Airwave, laptops with Wi-Fi, the old PRC 320 Clansman has long gone. But, all these modern gizmos come with a price and the vehicles are constantly in and out of the garages trying to find the elusive ‘gremlins’ that stop them dead in their tracks. Each team still has a L/R for towing as the Isuzu’s don’t have a tow hitch and the consensus is that the L/R is still the best option for any serious off-roading. Communications: Oh, the memories of the VHF ‘brick’! A FM VHF radio encased in a heavy bulky waterproof casing that nobody wanted to carry. Parties could go out into the hills and the next time you heard from them was as they walked back into the bothy; many a restless hour was spent by a TL waiting to hear what had become of their troops! If you wanted to speak to the civilian teams you had to carry an AM VHF variant, so 2 ‘bricks’. On some jobs you were sent off to do a ‘link’ carrying a VHF ‘brick’, a big box of an AM VHF and the Clansman plus all the ‘link kit’… nobody readily volunteered to be ‘link’. Today we have compact VHF radios that are preloaded with all the MRT frequencies and have a scanning facility. Mobile phones which when you have a signal are priceless and Airwave. In the old days HF was the most reliable form of comms we had (we still use it) but today it is Airwave that we rely on the most. You can rely on having Airwave comms in all but the most remote parts of the UK, it is used by all the emergency services and disaster co-ordination organisations. It is rare now for a TL not to be able to contact all MRT parties, not unheard off but there are far fewer restless hours. Clothing Equipment: A massive subject and this is where things have really changed and I will only cover a few things. In the eighties we got issued a pair of ‘Dollies’ which you used all year round. Today you get boots for summer, boots for winter, rock climbing boots, boots with gaiters fitted, gortex boots pretty much any type of boot on the market! I remember us all getting a fad for KSB’s and saving our pennies and buying them ourselves. ¾ length hairy and Rohan breeches, long red socks, white thermal tops that stretched to twice their size, a blue cotton type shirt, green issue Army style jumper and council worker type waterproofs. It didn’t take you long to invest in Ron Hill tracksters and a Helly Hansen short zip top, this became the default ‘uniform’ of the MR troop for any time of the year!!! I can remember the buzz at Leuchars when we got issued this fancy new thing called gortex. It was from Snowdon Mouldings and wonderful, Slioch remained a mainstay for many years and we now use Mountain Equipment gortex. The development with mountain clothing and equipment has been phenomenal and is ever evolving. Simple things like the range of base layers to suit your activity is baffling, GPS watches, centralised maps, gloves that the manufacturers nearly guarantee will do any climb for you! High profile equipment failures and shortfalls highlighted in the Iraq and Afghanistan conflicts has made the MOD very aware of their responsibility to provide sufficient equipment ‘fit-for-purpose’ and the MRS has access to whatever on the market we think best suits our needs. A long way from the days when troops had to put up with old kit that had been bulk bought and would not be replaced until the depots had been emptied! Women: Remember the days when the thought of women on the team was considered sacrilege? A battle was fought in the eighties to see if women should be allowed to join the MRS, was it won or lost! Viewpoints differed, feelings ran high, open letters were printed, warring parties postured and delivered prophecies of doom and triumph. The reviewing team, a doughty female Wg Cdr, a cute female Sqn Ldr and there was another but my memory fails me, would spend the weekend with Leu MRT at Corpach. The Corpach Village Hall was not the best of bothies and the Wg Cdr took one look and promptly took her team off stay in a hotel in Fort William! They returned early on Sat morning to see the team have breakfast and depart for the hill, there were a few comments on communal living arrangements and facilities having to improve. I was away up on a wet Tower Ridge when we got a call to say a Sea King had crashed on Creag Meagaidh, with it being our 202 sqn mates we flew off the hill and back to the bothy. The usual organised mayhem was happening with troops streaming in stripping off wet clothing and put on dry kit, there was plenty of flesh to be seen all over the place. The Wg Cdr was mortified and stormed off, the Sqn Ldr was later heard to say that she thoroughly enjoyed the spectacle but also understood that it was not for show but necessary. Funny how they seen things so differently, whatever they thought the decision was made that women could join the MRS. A bit more pandemonium followed, threats of resignation, exclamations of the imminent demise of the MRS! Well we are still here, nobody questions the notion of a woman wanting to join the MRS. I personally don’t recall having any strong views either way about women on the team but I do know that the early pioneers were determined and talented ladies. They challenged a male dominated environment and succeeded, often against some open hostility. I find it amusing to reflect on all the commotion that went on when we see how much women have and continue to add to the MRS.
Helicopters: The relationship with the RAF SAR helicopters (affectionally know as our yellow taxi’s) was special and endured until they day they flew their last sortie. For me it all started at Leuchars where 22 Sqn was also based with the Wessex helicopter. The crossover of banter, knowledge, training and socialising was wonderful. The OIC MRT was generally from 22 Sqn to we always had strong ties which only improved with having the fabulous MACR Mick Anderson on the team. I like to think we complemented each other, MRS with its loveable rouges and eccentricities and the SAR gang also slightly ‘different’ from the usual flying crowd. It was a sad day to see the ‘yellow budgie’ grounded but not all is lost as great relationships have been formed with the MCA crews, some who can boast of very strong links to previous lives flying around in ‘yellow taxi’s’. Corporate image: This always makes me smile as I regularly get moaned at about having to wear the ‘corporate image’ gear. These days it is all about promoting the MRS/RAF/MOD, the days of sitting back happy in the knowledge the MRS will never be cut is long gone. We mustfight for our existence. I come from an era of modesty, we did not openly flaunt our successes, he did blow our own trumpet, we simply knew we did a good job and that was enough for us. We now have a duty to ensure that we are seen to be doing a good job and the higher management are fully aware. Simply having an RAF MRS badge on your gortex jacket is a powerful advert when pictures of MRT Ops appear on national or local news. They are an excellent reminder that we are still here and still doing it on behalf of the RAF/MOD. As I look back I can’t help but smile, people moan about the fact we never used to have to do this but is this true? The MRS has a colour code for its ‘jumper’ and each MRT had its own colour code, Leuchars had a black jumper with a single light blue band. When you look back at old team photos these jumpers were always on display, was this a form of corporate image? Even wearing the old green Army style jumpers could fall into this bracket. But I also fondly reminisce about the array of colours and garments that the troops would adorn themselves with. At times you would have thought it was an ensemble from a circus but that’s what happens when you collect all the waifs and strays nobody else wants! Modern day corporate image.Jacobs coat of many colours. 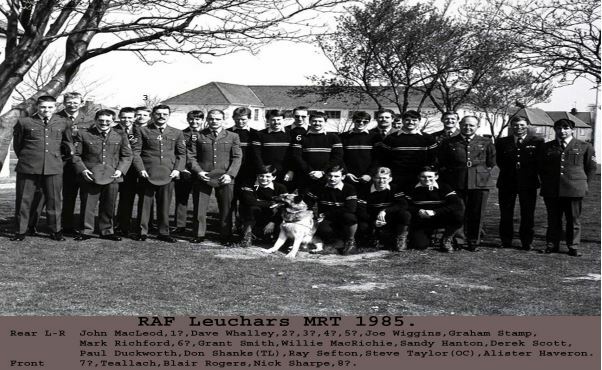 Leuchars 1985 team photo: most (not all) of the people were on the team when I joined in 84. There are some memorable people missing but I did a couple of tours on the big ‘L’ so might be a little mixed up on dates; Jim Smith, Mick Timms, Mick Anderson, Brian Carr, John Chapman, Pete Amphlett,Jim Rintoul, Andy Craig, sorry if I missed anyone but time dims the memory. Thank you my good pal for this great insight into a big piece of modern RAF MRT History as always Willie never mentions his exploits but give him a dram on the right night and maybe you will get a few tales. This man has been most places a skilled mountaineer and a true pal one who you need when things are hard. 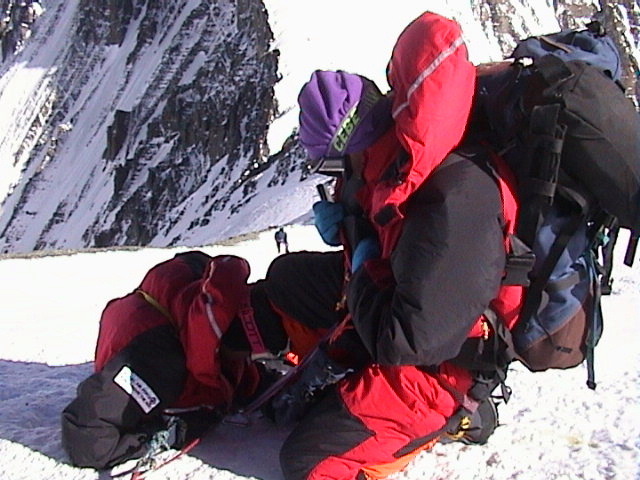 2001 Willie above North Col helping one of our troops who was ill as usual Willie was the man. 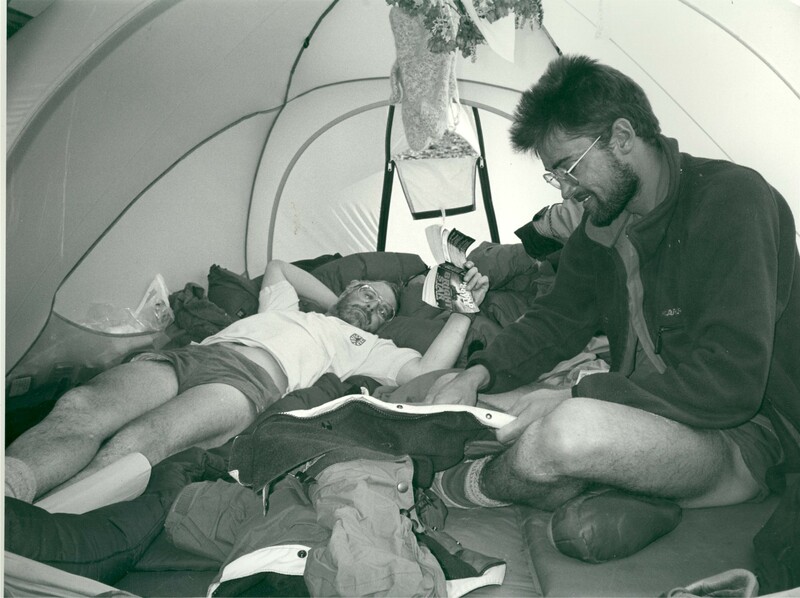 This entry was posted in Aircraft incidents, Articles, Bothies, Enviroment, Equipment, Expeditions - Alaska - Himalayas etc, Family, Friends, Mountain rescue, Mountaineering, People, Rock Climbing, Scottish winter climbing., Views Mountaineering, Weather. Bookmark the permalink. I really enjoy reading through your posts!